All models come standard with Sapele back and sides, and either Western Red Cedar or Sitka Spruce top. Binding is either tortoise or ivory celluloid. Tuners are Gotoh minis. Rosettes are chip inlay, using natural shell or stone material and jewelers epoxy. Necks are 3 piece. The Model D is a modified dread. The bracing patterned designed for this instrument gives the top enough flex for a great bass and a powerful treble. The long scale (25.5”) pushes this instruments tone towards the fundamental, giving a crisp attack to each note and great cutting power. The back is braced with three “fanned” braces that promote complexity of tone and minimize weight. Great in rosewood, for those playing bluegrass, or sapele for strumming Country tunes. The Model K is a mid-sized jumbo. The bracing here is designed for maximum control in the mid and treble. The shorter scale (24.625”) lends a lushness to the character and a forgiving attack. Like the “D” the back is brace with three “fanned” braces. This model is great in maple, giving a jazzy tone, where rosewood is great for fingerstyle. This one has a cutaway and paduak bridge. The Model R harkens back to early days of American steel string guitars. Based on a late 19th Century guitar, it is perfect for voice accompaniment of folk playing. Similar in size to a “OO” it is comfortable to play and very responsive. The bracing is light and spare, appropriate for the smaller size of the instrument. Silk core strings really sing on this. A fine choice in any wood. 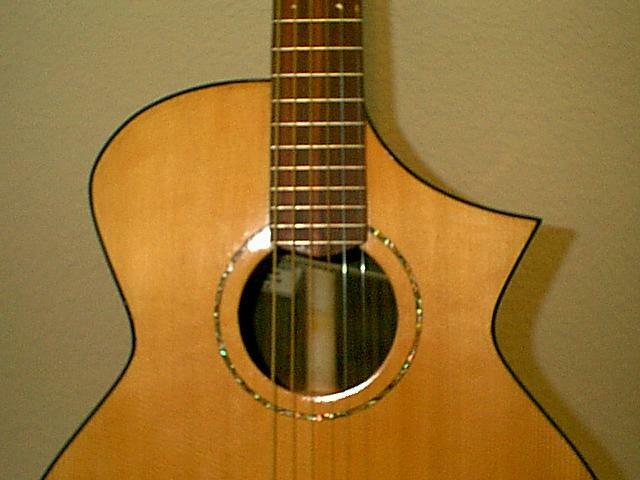 This image is of the 12 fret model. The Model RC uses the body of the R with a 25.5" scale at 12 frets combined with a light radial bracing to create my interpretation of a classical guitar. The neck uses a tapered profile that is available in 50, 52, and 54mm at the nut. 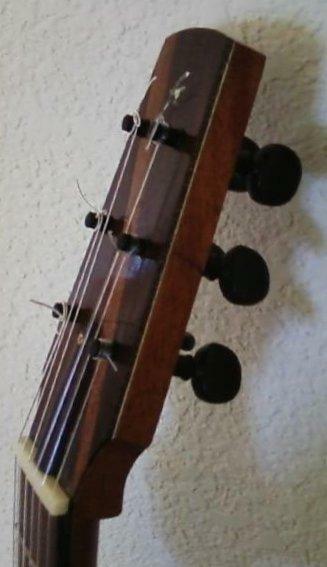 Tuners are Peghed planetary pegs giving a traditional look (like many older instruments or flamencos) but with the comfort and stability of modern technology. Indian Rosewood is standard with western red cedar or Sitka spruce for the soundboard. Dimensions as above for Model R.